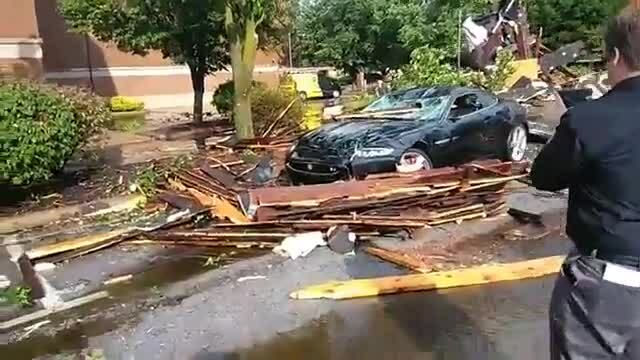 A severe storm has caused significant damage in Sandusky, including the collapse of a building’s roof and damage to multiple other structures and vehicles. A 20-minute Facebook Live stream from Erie County Scanner Uncensored shows the extent of the damage, including a large portion of the roof of a building that was ripped off and tossed onto Market Street in downtown Sandusky. The video also shows trees down and other building debris scattered across the city streets. According to the City of Sandusky, two buildings were damaged, including damage to their roofs. The roofs flew 50 to 100 feet into the parking lot, damaging six cars that were towed from the scene, according to city officials. Fortunately, no one was injured, the city said. The Power of 5 Weather Team said Sandusky experienced straight-line winds of 50 to 60 mph shortly after 6 p.m. They said while there was a severe thunderstorm, there was no indication of a tornado. News 5 has reached out to the City of Sandusky Fire Department for more details about the damage caused, and if anyone was injured. So far, we have not heard back. News 5 has a crew heading to the scene. We will continue to provide updates as they become available.